Hello everyone, this is part 2 of my recent experiences and clear visions posting during the most recent energy healings. You can read Part 1 by clicking HERE. So once the scene is set for the healing (see part 1 posting), I call upon Arch Angel Raphael to join me. I feel usually feel his energy presence next to mine very quickly and I see him as this beautiful emerald green emanating being of light with long dark thick wavy hair with a bit of a darker skin and a dark heavy accent. His energy and his presence is absolutely amazing. I have been shown that I am in a circular room. I do not see any walls, ceiling or doors. This room is actually a healing chamber. The floor is a huge healing crystal and there are 12 large and tall (12 feet I would guess) healing crystals placed in a circle arrangement that are formed from the ground up that are separate by a few feet. These 12 healing crystals are extensions from the crystal healing floor. In the center stands the person I am healing and I am next to that person with Arch Angel Raphael next to me. This healing chamber is a circular room encased in the center of the Metatron Cube with the Merkabah Star encasing the Metatron Cube and the Reiki symbols above and below the Merkabah Star (as outlined in the Part 1 posting). At this point, I always ask Arch Angel Raphael to send down his emerald green light and energy to the person that is being healed. I ask him to remove all diseased energy, all stuck energy, all congested energy, and everything that does not serve that person’s highest and best good that is not of the light. I ask that this be removed from the physical body, etheric body, emotional body, mental body, spiritual body, in addition to, from all the physical cells of the physical body, energy chakras and meridians, and inner and outer auras. At that point, all the crystals, including the floor, turn green and Arch Angel Raphael then cleanses the person and their energies and energizes them as well. 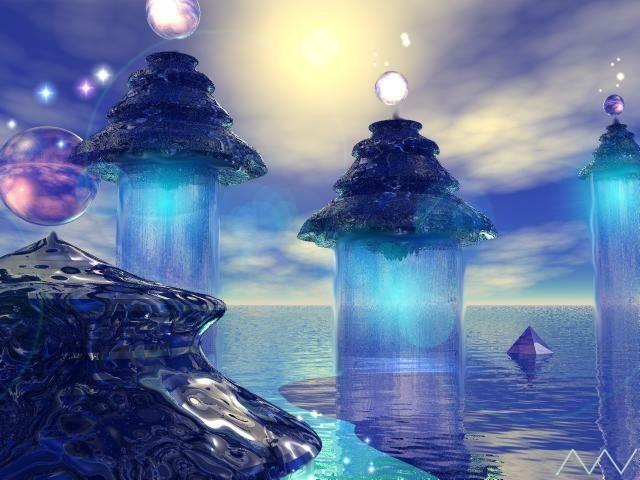 I feel the crystals energies vibrating and humming deeply. After that, I thank Arch Angel Raphael and he usually leaves. I then bring in Saint Germain and feel his energies and presence. I see Saint Germain radiating violet around his presence with a beard and always with so much love radiating at me with his beautiful smile. I have a very strong connection with Saint Germain. I then invoke the violet flame, and as I do this, the crystals and floor now turn violet and are no longer green. I was shown to place the violet flame from the outside and work the flame inwards toward the heart. The reason is that the heart is the ascension chamber and gate and a closed heart will not allow the higher light to flow into your body allowing the higher resonance that is required to ascend. All flows from the heart center. I was shown how to place the violet flame on the person being healed starting with their outer aura, and working towards their heart. Once the flame is burning on the outer aura, and burns for a while, it then goes and burns to the spiritual body, then the mental body, then the emotional body, then the etheric body, then the inner aura, then the major, minor, and mini chakras, then the meridians, then all the physical organs and cells and eventually settles in the heart. Once in the heart, the controlled deep violet flame burns deeply with love. Once the violet flame is in the heart burning, I thank Saint Germain for his help and he usually leaves after a warm goodbye blessings exchange (as with Arch Angel Raphael). I then continue with more cleansing by feeling the etheric body and removing anything that I see and feel needs to be removed. I was shown that a poor energy cleansing will result in a poor healing as you will be energizing fresh energies with diseased energies that have not been properly cleansed. Thus, I have been shown to visualize so much, to see the person, to feel the body, to sense the blockages. My third eye is very open during these healings and I feel that I am actually there in the healing chamber. It is not a visualization. It is more that I am actually there. I see the person clearly as I see my friends and family. I talk to them and interact with them. I see their etheric body and I see through them and see within them and all their physical etheric organs. I see Arch Angel Raphael and Saint Germain so clearly as well and feel their energies very strongly. They always say hello to the person being healed and interact with the person being healed. So that is the cleansing visions part of the posting. The next post will discuss what I have been shown when I energize the body. The visions become more intense at the energizing stage so you do not want to miss the next posts. Continue reading below if you are interested in a free energy healing from me. I need to add more open healing slots as I am booked through the end of April. Please be patient with me. We are in some beautiful shifting times. Stay happy and in love and know that you are the Divine Presence! !